A slip is a semi-fluid coloured clay used either for coating an earthenware vessel or for decorating it before glazing. Here the body of the bowl is buff, and it has been covered with a white slip as a ground colour. A thick brown slip has been used for the painted design and the pot has finally been covered with a transparent yellow glaze, giving it a visually robust impact. Slip painting was very common in North-east Iran and Transoxania (the lands beyond the Oxus) in the ninth - tenth centuries, under the Samanid dynasty, and less pretentious products using the same technique are found throughout central Iran during the same period. The design combines the Islamic taste for radial designs on ceramics, in particular stellar and cruciform patterns, with calligraphy. A cruciform ornament dominates, but as so often in Islamic pottery, a secondary cross fills out the spaces, thus completing the effect and providing the visual balance evidently desired by both craftsmen and client. 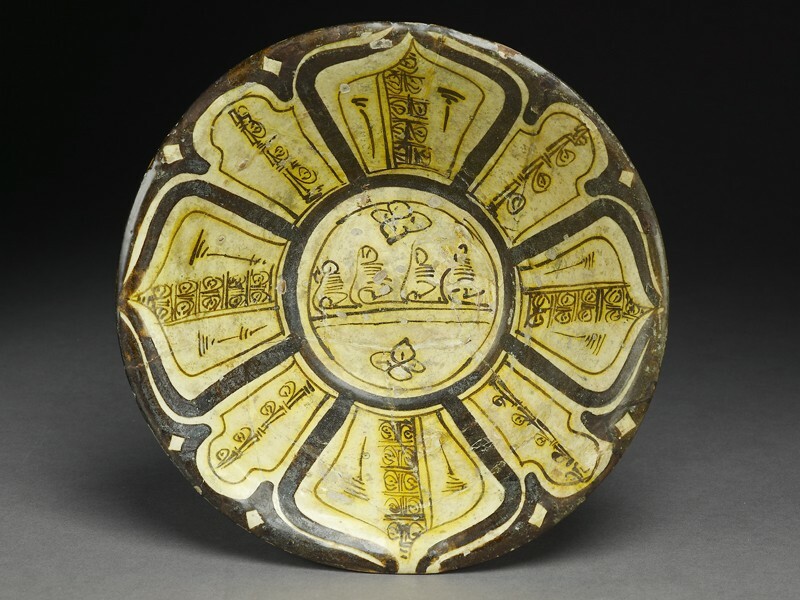 The calligraphy on this bowl is difficult to recognise, but the thinly-painted filler ornament of the central circle and of each radial segment is in fact derived from kufic (geometrically-formed) Arabic script. It cannot be read, but it was probably intended to convey, symbolically, the good wishes which such inscriptions normally contained.